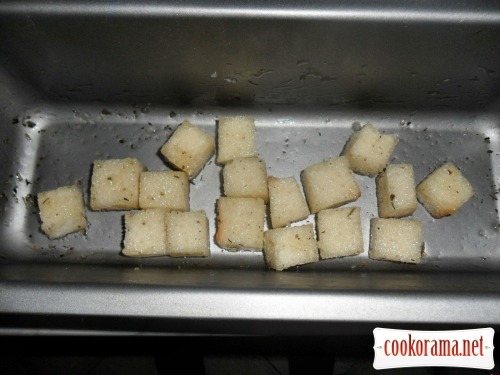 Prepare the croutons, for this dice loaf with sides of 1,5 сm. 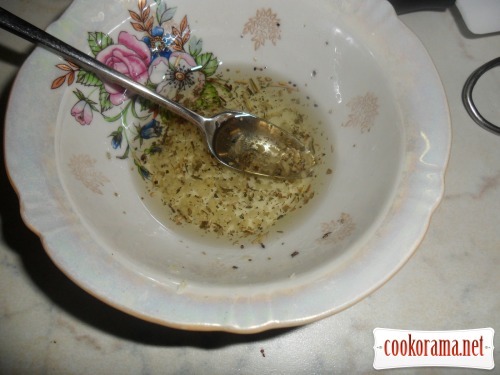 Mix oil with garlic, Provence herbs, and salt. 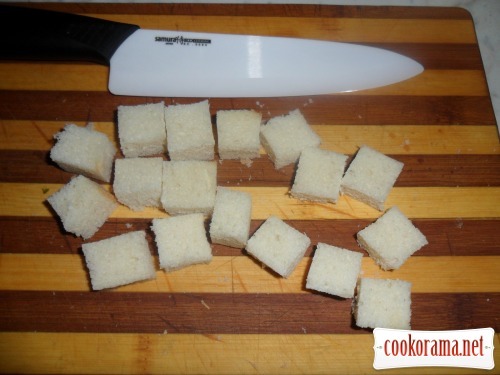 Put our cubes into baking sheet, pour with this mixture, and mix well. And put in the oven for 15-20 min at 160-170 ℃. From time to time mix them. Slice the chicken fillet into strips; add salt, pepper, sesame, stirring, fry on a strong heat for 5-7 min, avoiding deep frying of the meat, we need it juicy inside. 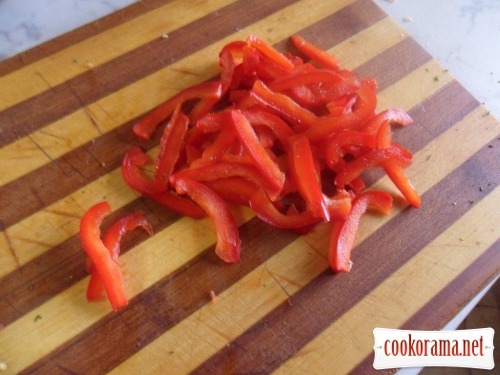 Chop the cabbage and slice the Bulgarian pepper. 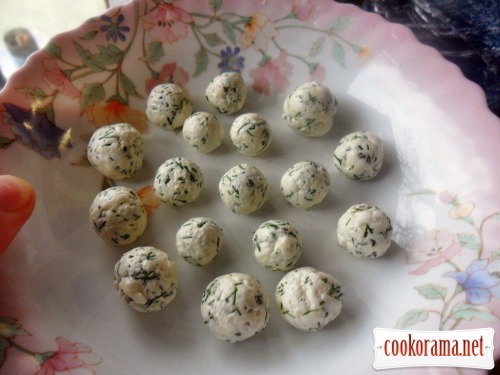 Then make cheese balls. 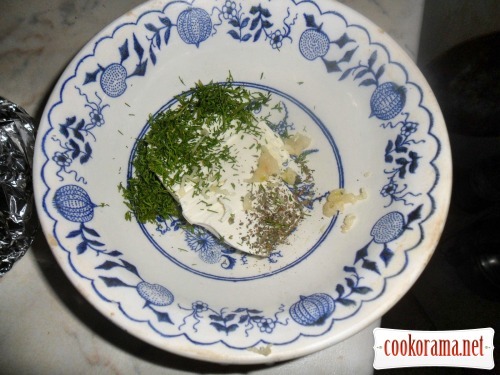 To do this, take the Fetaki cheese, add to it the finely chopped dill, pressed garlic, basil, and soften it with a fork (I added a little cream for a softer consistency). Then from this mass we sculpt, with hands, balls in the palms, like plasticine. For dressing mix the mayonnaise, soy sauce, garlic, tangerine juice. Mix cabbage, corn, finely sliced onion, bell pepper, chicken, put on a plate, on the top put cheese balls, croutons and pour dressing. 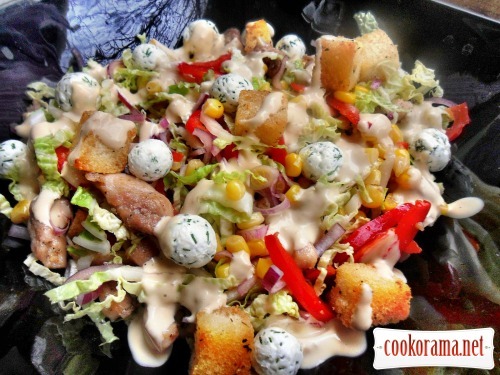 Top of recipe "Delicious salad with chinese cabbage, chicken, croutons and original dressing"
Салат праздничный однозначно! интересная заправка… Понравились: и фото, и пошаговое описание. За что спасибо? Это вам спасибо за рецепт! Очень хороший салатик! Красивое оформление и интригующее название!